(Bloomberg Opinion) -- First, it was the IL&FS Group that ran out of money. Now that the bankrupt Indian infrastructure lender-operator has been sequestered from creditors, the country’s securitization industry is on borrowed time. It all began on Tuesday with S&P Global’s Indian affiliate, Crisil, downgrading Jharkhand Road Projects Implementation Co.’s annuity-backed bonds to D after it skipped interest and principal payments. It’s a strategic default on an instrument rated AA just last week. The borrower had money. 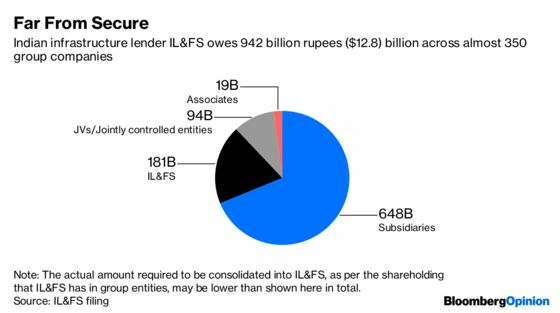 It reneged on the obligation because the IL&FS parent and 348 group companies have been allowed by the country’s bankruptcy tribunal to block creditors while a government-appointed board sorts out the $12.8 billion debt load. What makes Jharkhand’s default disturbing is that investors believed its securitized debt would be unaffected by the parent’s bankruptcy. These bonds were legally backed by annuity income from the Indian state of Jharkhand. That assurance was the basic premise on which they invested in the structured debt obligation in the first place. Now this illusion has been shattered, let’s look at the implications. However, that’s where the good news ends because the damage to India’s shadow-banking industry is incalculable. Most gray market lenders don’t finance roads and bridges, but advance money raised from deposit-taking banks and money-market mutual funds to small businesses and micro-finance borrowers, as well as against home and vehicle ownership. Their wholesale borrowing costs spiked in the aftermath of IL&FS defaults. Since their assets are mostly doing just fine, and certainly a lot better than conventional banks’ big-ticket advances to India Inc., the shadow financiers started to package small loans for sale to the likes of State Bank of India. The whole point of the exercise was to create pooled assets that would survive the originator’s bankruptcy. Jharkhand’s default has removed that comfort. Last quarter’s record $3.7 billion monthly run rate of Indian securitization deals is suddenly at risk. When IL&FS started to blow up in September, I warned that this was India’s mini-Lehman moment. A fairly swift rescue by the authorities managed to contain a full-blown crisis of confidence. But the Jharkhand default has put the genie of mistrust out of the bottle again. ICRA, the local affiliate of Moody’s Investors Service, on Tuesday put the AA and AAA ratings of six Indian bond funds on rating watch because of their exposure to securities debt raised by Jharkhand and other IL&FS-linked special purpose vehicles. An immediate order to IL&FS’s new board to honor securitized debt is the need of the hour. Otherwise, India’s funding markets could see a repeat of last autumn’s freeze. Back then, the government blamed the central bank for not infusing enough liquidity into the system; now that New Delhi has swapped a difficult technocrat with a former bureaucrat as the Reserve Bank governor, whom will it blame for any fresh tremors? The collapse of IL&FS has put a question mark on India’s model of infrastructure financing. Was involving the private sector to break the constraint of inadequate tax resources a viable alternative? Or did it merely allow IL&FS’s erstwhile management to get rich at the expense of everyone else by privatizing profits, and socializing losses? Even now, India needs hundreds of billions of dollars for roads, bridges and power plants. It will be hard to raise that money if ring-fenced investments go from AA one week to D the next. When IL&FS stopped paying its debt, rating firms were rightly blamed for being asleep at the switch. The Jharkhand default, however, can’t be pinned on analytical incompetence. India’s bankruptcy tribunal must understand that it’s there to prevent contagion, not to manufacture one of its own. Andy Mukherjee is a Bloomberg Opinion columnist covering industrial companies and financial services. He previously was a columnist for Reuters Breakingviews. He has also worked for the Straits Times, ET NOW and Bloomberg News.